1. Who are you and how would you describe your business? 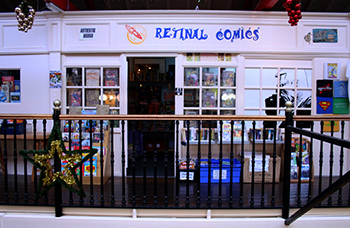 – Retinal Comics is a small independent store, mostly run by myself ‘Craigus Barry’. We specialise in dealing Science-Fiction comics as well as stocking comic books of a varied style and genre, an example being Manga. 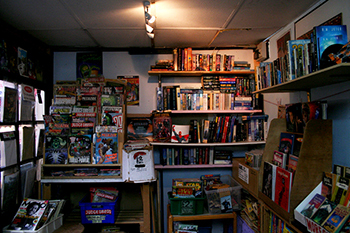 Board games such as Dudgeon and Dragons are also sold here and in addition to this, we have a collection of figurines based upon characters from various popular film franchises. We also buy comics, as well as sell. 2. 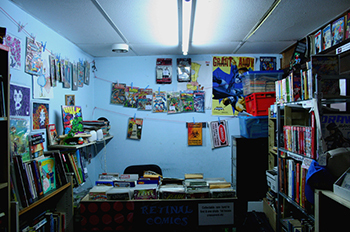 With the current financial climate, has it been a challenge to open a comic book store and attract target customers? – Well yeah, sure it’s been a huge challenge, naturally. It’s been helped a lot though, by the response of the community. There seems to be a healthy amount of people in the local area who are interested in what my store has to offer. 3. Do you currently or perhaps plan to expand your business into the online market? – At the moment, the primary focus is building on the physical store we have now and making sure we’ve got a good collection of comics on offer. Creating an online store is a possibility for the future. 4. So how did you first make a connection with comics and would you say you are an artist yourself? – I’m not an artist at all to be honest, I prefer to read myself and sell work through the store. During my childhood was when I first picked up a comic, as it is for most, though my curiosity grew as I got older and have been collecting ever since really. 5. As well as working within the comic book industry, are you personally involved in any artistic endeavors? – Yeah, I enjoy writing and playing music, which is a big part of my life. 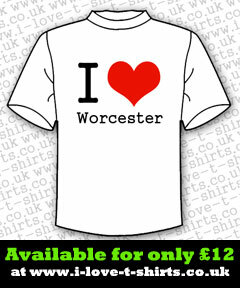 There are some very good music venues in the Worcester area. Then there’s ‘Slap’ magazine, which specialises in music news, I periodically write articles for them. 6. Okay, well last question. Is there somewhere online where potential customers and lovers of comic book art can discover your business?